The Force is very strong at Disneyland! We just returned from a preview of Season of the Force at Disneyland and it’s sure to delight Star Wars fans. While we wait for the creation of Star Wars Land (which breaks ground in January 2016), this is a REALLY awesome way to celebrate all-things Star Wars now! 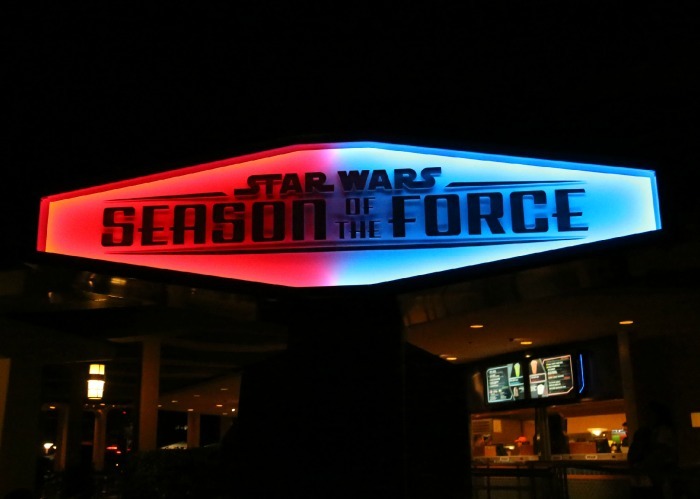 Season of the Force starts at Disneyland TODAY (November 16th) and will be running for an indefinite period of time. 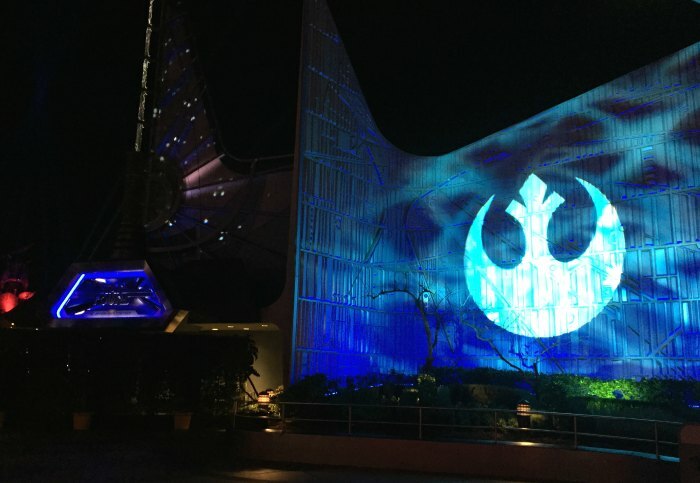 So, it’s the perfect time for Star Wars fans to plan their Disney trip! We’ve got your Season of the Force guide below with our list of 7 must-do Star Wars experiences! 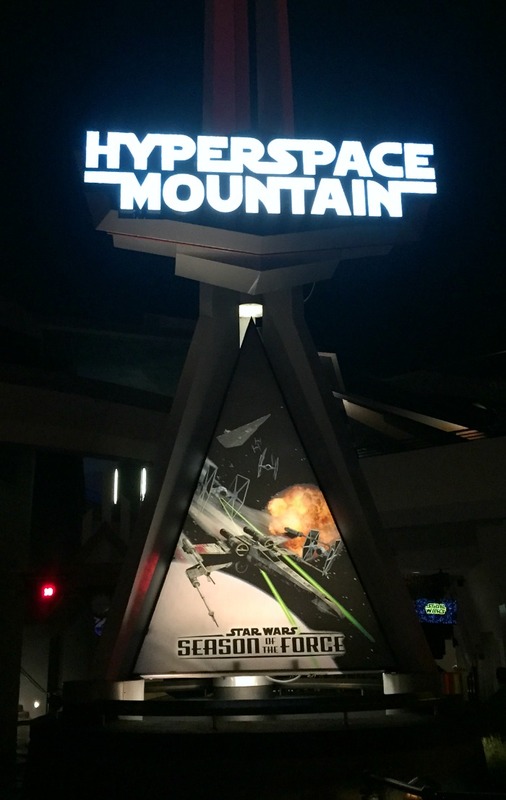 On this reimagined Space Moutnain ride, you’ll join an X-Wing Starfighter battle as you soar through the galaxy. There’s new digital effects overlayed on the ride and a new soundtrack created by none other than John Williams and recorded by the London Symphony Orchestra. Just the sign at the ride entrance alone is awesome! Star Tours has been a long-standing favorite for Star Wars fans (since debuting in Disneyland in 1987). Now, the ride has a scene inspired from the new movie Star Wars: The Force Awakens. We got to experience a new adventure on Planet Jakku and even got to see our new favorite character BB-8! Be on the lookout for another new character as well! We LOVED the way they put the footage together and this made us all VERY excited to see The Force Awakens on the big screen in December. And, if you’re new to the world of Star Wars, this movie is a very good overview! Star Wars Launch Bay is like your command center for the Season of the Force fun. 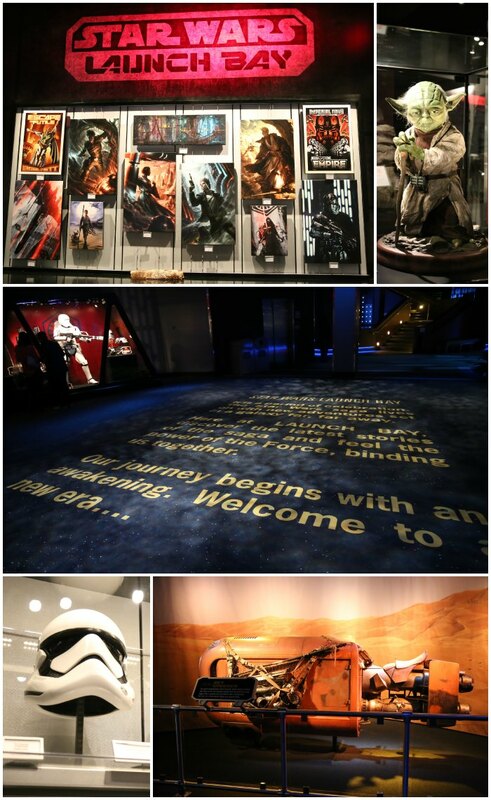 The entire bottom floor of the former Innoventions building is dedicated to all things Star Wars. 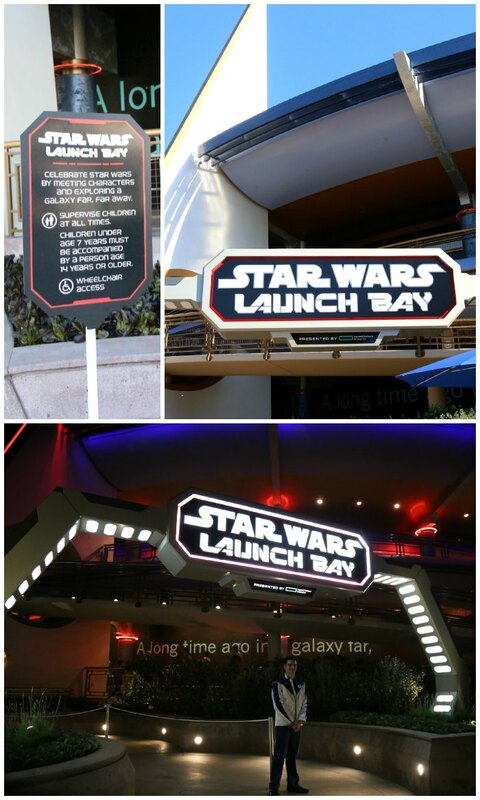 Inside the launch bay, you’ll find a variety of awesome items and experiences! There are authentic replicas of models & costumes from the new film, Star Wars: The Force Awakens, plus collectible merchandise, gaming areas, the Launch Bay Theater and more! As you venture through all the awesome displays, you can explore your inner dark side and channel the light side of the Force. 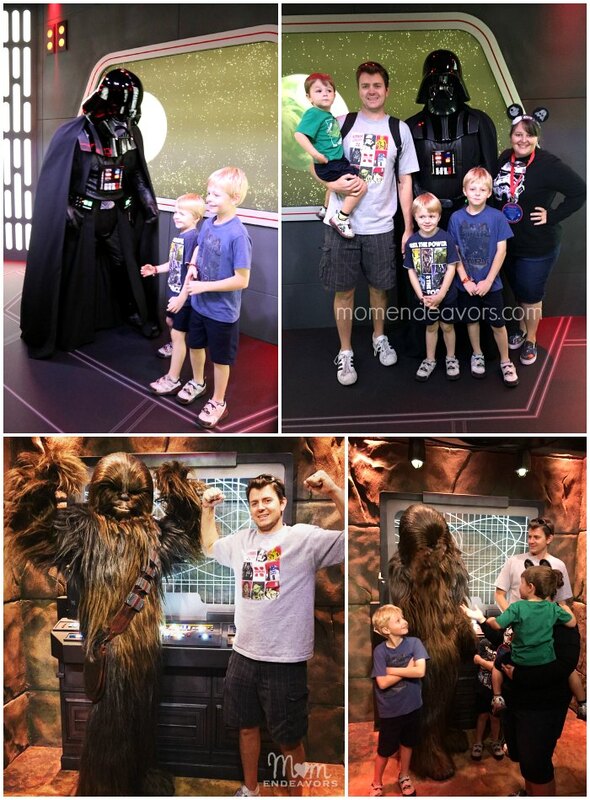 You might even happen to stumble upon an Imperial Ship and come face to face with Darth Vader. Or, you might find yourself at a Rebel Base and meet Chewbacca! The character encounters were our absolute favorite part of the Launch Bay. 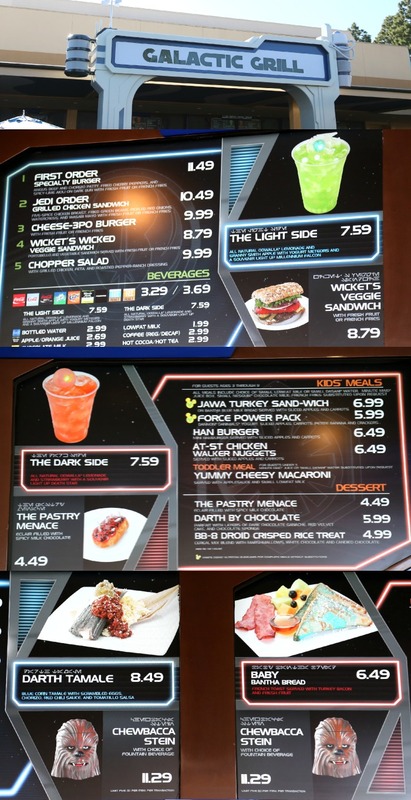 Going hand in hand with the Star Wars food, is Star Wars merchandise! 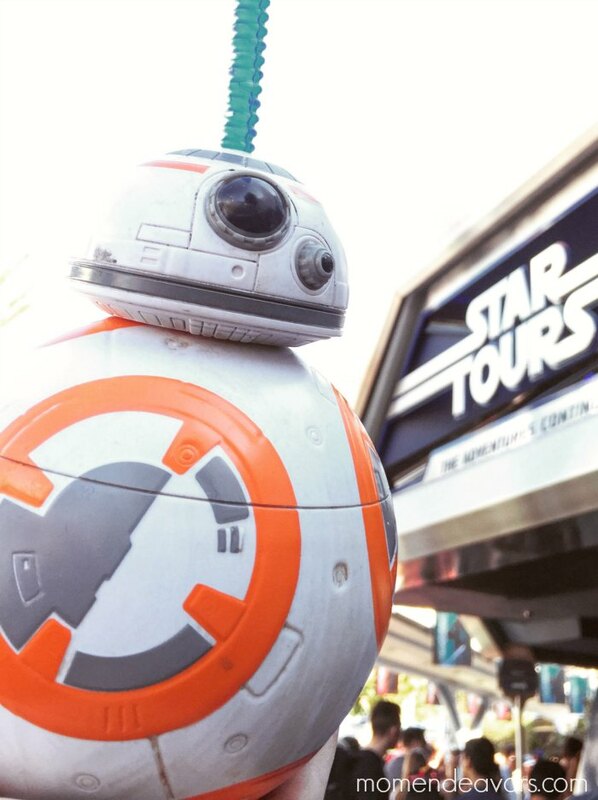 In addition to the light-up cubes and carbonite container, you can find Chewbacca Steins, TIE Fighter Popcorn Buckets, and our personal favorite, BB-8 Drink Sippers!! They are SO cute! The Star Trader is absolutely packed FULL of amazing Star Wars products! They’ve started selling Her Universe products (which is great news for female Star Wars fans) and there is quite a lot of The Force Awakens merchandise in the store (including Sphero BB-8). 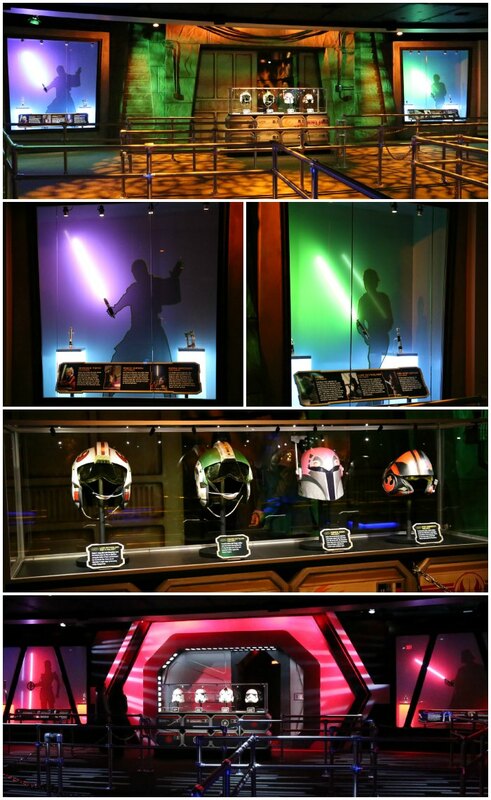 For experiences, you’ll find a light saber building station and a droid building station! Unfortunately, this reimagined Jedi Training wasn’t open for a preview. But, it sounds like it’s going to be great! Debuting on December 8th, this new battle experience will take younglings to the secret site of an ancient Jedi temple, where they will discover if they have the makings of a true Jedi. Villains such as Darth Vader and the Seventh Sister Inquisitor from the popular Disney XD series Star Wars Rebels join the adventure! So, this is clearly a great time to plan a trip to Disneyland – especially if you’re a Star Wars fan! This should tide us over a little as we all anxiously wait for a full Star Wars Land to open! 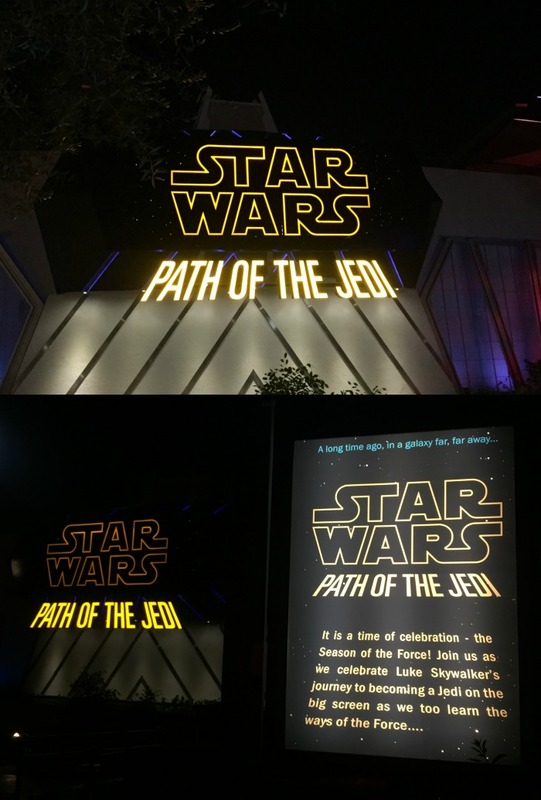 And, if Walt Disney World is your park…Season of the Force will be arriving there soon! What part of Season of the Force are YOU most excited about? Disclosure: We were invited to attend a special media preview of Season of the Force which included complimentary park admission. All opinions, experiences, and photographs are entirely my own. This makes me want to bump up our trip and go experience these adventures then back again after the Land opens! SO fun!